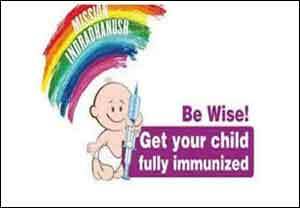 New Delhi: The Union Health Ministry plans to achieve full immunisation coverage under its ‘Mission Indradhanush’ by 2018. A total of 118 districts, including 52 districts of north east states and 17 in urban areas, will be targeted under the intensified programme, an official statement said. Besides, states will conduct Mission Indradhanush drives for seven working days from 7th of every month, starting from October for four consecutive months, excluding Sundays, holidays and routine immunisation days. “Under ‘Intensified Mission Indradhanush’, greater focus will be given on urban areas, which was one of the gaps of the programme earlier. This will be done through mapping of all under-served population in urban areas and need-based deployment of ANMs (auxiliary nurse midwife) for providing vaccination services in these areas,” the statement said. Intensive monitoring and strong accountability mechanism is being established at all levels with cabinet secretary (at national level) and chief secretary (state level) reviewing the preparations, it said. A distinctive feature of Intensified Mission Indradhanush is that greater focus is being given on convergence with other ministries/departments, especially women and child development, panchayati raj, urban development among others. The convergence of ground level workers of various departments like ASHA, ANMs, anganwadi workers, zilapreraks under National Urban Livelihoods Mission (NULM), self-help groups etc will be crucial for successful implementation of the programme, the statemnet said. Universal Immunisation Programme (UIP) of India prevents mortality and morbidity in children and pregnant women against 12 vaccine preventable diseases. Four phases of Mission Indradhanush have been completed in 528 districts across the country. More than 2.47 crore children and around 67 lakh pregnant women have been vaccinated under the programme so far.